South Korean President Moon Jae-In plans to meet North leader Kim Jong Un next month and US president Donald Trump has also said he wants to meet Kim. Moon Jae-In feels that summits should end the nuclear and peace issues on the Korean peninsula. Seoul: South Korean President Moon Jae-in said on Wednesday a three-way summit with North Korea and the United States is possible and that talks should aim for an end to the nuclear threat on the Korean peninsula. Moon is planning a meeting with North Korean leader Kim Jong Un next month after a flurry of diplomatic activity in Asia, Europe and the United States. US President Donald Trump has also said he would meet Kim by the end of May. "A North Korea-US summit would be a historic event in itself following an inter-Korean summit," Moon said at the presidential Blue House in Seoul after a preparatory meeting for the inter-Korean summit. "Depending on the location, it could be even more dramatic. And depending on progress, it may lead to a three-way summit between the South, North and the United States," he said. 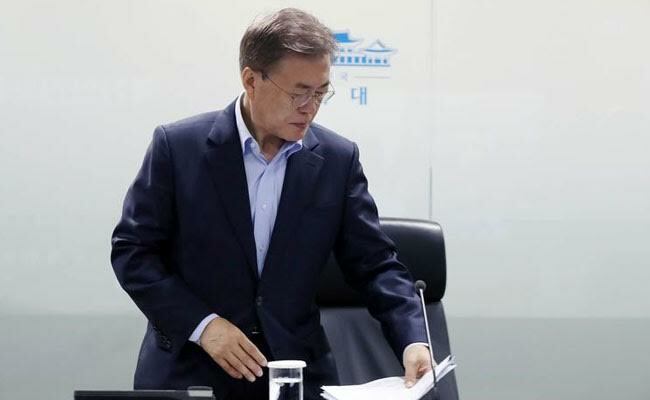 Seoul officials are considering the border truce village of Panmunjom, where Moon and Kim are set for a one-day meeting, as the venue for talks between not only Kim and Moon but also a possible three-way meeting. The rush of recent diplomatic contacts began in the lead-up to the Winter Olympics in South Korea last month and helped ease tensions on the Korean peninsula caused by North Korea's pursuit of its nuclear and missile programmes in defiance of United Nations Security Council sanctions. Moon said the series of summits should aim for a "complete end" to the nuclear and peace issues on the Korean peninsula. He said he has a "clear goal and vision", which is for the establishment of a lasting peace to replace the ceasefire signed at the end of the 1950-53 Korean war. It also includes the normalisation of North Korea-US relations, the development of inter-Korean ties, and economic cooperation involving Pyongyang and Washington, he said. "Whether the two Koreas live together or separately, we have to make it in a way that they prosper together and in peace, without interfering or causing damage to each other," Moon said. South Korea and the United States will resume joint military drills next month, although the exercises are expected to overlap with the inter-Korean summit. Seoul and Washington delayed the annual drills until after the Winter Olympics, helping to foster conditions for a restart of intra-Korea talks. North Korea regularly denounces the drills as preparation for war but a South Korean special envoy has said Kim understood that the allies must continue their "routine" exercises. That exchange has not been confirmed. The North's official KCNA news agency said on Wednesday a "dramatic atmosphere for reconciliation" has been created in cross-border ties and there has been has also been a sign of change in North Korea-US relations. That was "thanks to the proactive measure and peace-loving proposal" made by Pyongyang, not Trump's campaign to put maximum pressure on the country, KCNA said in a commentary. A Blue House official also said South Korea was in discussion with China and Japan for a three-way summit in Tokyo in early May. The three countries have not held such a meeting since November 2015, with relations soured by historical and territorial tension.